Locals go to the B.T.C. Old-Fashioned Grocery in Water Valley, Mississippi, for its Skillet Biscuits and Sausage Gravy breakfasts, made-to-order chicken salad and spicy Tex-Mex Pimiento Cheese sandwiches, and daily specials like Shrimp and Grits that are as good as momma made. The B.T.C. 's freezers are stocked with take-home Southern Yellow Squash Casseroles and its counter is piled high with swee… ts like Peach Fried Pies as well as seasonal produce, local milk, and freshly baked bread. ';Be the Change' has always been the store's motto, and that's just what it has done. What started as a place to meet and eat is now so much more, as the grocery has become the heart of a now-bustling country town. The B.T.C. 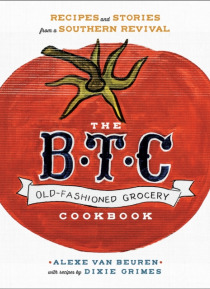 Old-Fashioned Grocery Cookbook shares 120 of the store's best recipes, giving home cooks everywhere a taste of the food that brought a community together, sparking friendships, reviving traditions, and revitalizing an American Main Street.